Dubai, UAE, April 02, 2019: We all want to look young and healthy, but as time passes, the effects of ageing impact how we look. The areas around eyes and lips have a way of revealing if one is fatigued or ageing. For many of us who are battered constantly with the stresses of daily life and other environmental factors, there is not a lot we can do to counter this. However, there are very effective solutions from brands such as Fillerina, who provide a very welcome but temporary fix to such highly undesired features. Fillerina is the result of five years of research at Labo Cosprophar Suisse, renowned for its expertise, high standards of clinical safety and ability to bring best-in-class products to the cosmetic industry and consumers. The newest formulation of Fillerina is the 3D Collagen. Collagen, as we all know, is the main structural protein found in skin and other connective tissues. It is the main fibrous element of the skin, responsible for its density and compactness. It creates a supporting structure that is filled with substances called Glycosaminoglycans, among which the main one is Hyaluronic Acid. 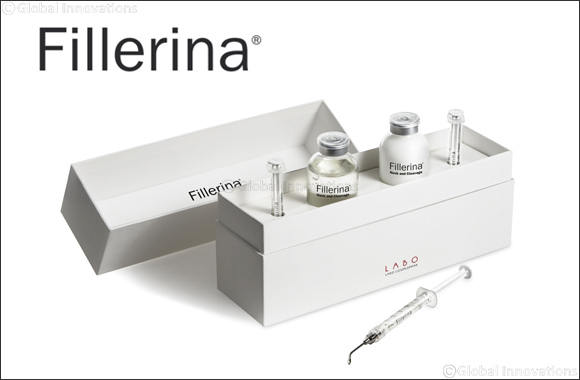 The 3D Collagen in Fillerina associates two new hyaluronic acids with very low molecular weight to its six hyaluronic acids, acids well known for their filling action. It also contains three molecules of collagen. All actives penetrate the skin layers to give the skin a deep redensifying effect and much needed physical support. The three molecules of collagen contained in the formulation have very different molecular weights: this characteristic deeply differentiates Fillerina collagen from any other cosmetic product containing generic collagen molecules. Fillerina now offers specific treatments for problematic areas. These new preparations are based on the 3D Collagen formulation, with modified concentrations of the active molecules according to the action to be performed and to the features of the area to be treated. As skin ages, the amount of hyaluronic acid and collagen that are present in the organism, and in particular in the skin progressively decreases. These deficiencies can be visible in the lip area, thus causing a loss in terms of volume, the appearance of wrinkles around the mouth and less definition of the lip’s profile. In the new Fillerina Lips and Mouth in Gel, the concentration of hyaluronic acid and collagen molecules is modulated to answer to the very specific needs of this particular area. A new brush-tip Applicator allows to dispense a generous amount of Gel and distribute it in a more uniform and comfortable way on both the lips and the mouth contour. Neck and cleavage are among the most problematic areas, that clearly show the passing of time. Being thin, the skin of the neck is subject to an easy ageing and to a quicker loss of elasticity and tone. The first signs can appear as early as the age of 25. Moreover, the skin cedes to gravity and gets covered by more and more visible, circular furrows. Cleavage is another area that is usually not cared enough about. Exposing to sun rays and sleeping on one side worsen the chrono-aging by promoting the formation of fan wrinkles in the triangle area between the breastbone and the collarbones. The eye contour area is particularly prone to the early appearance of wrinkles, especially on the external corner of the eye, the so-called crow’s feet wrinkles. To this phenomenon is associated the loss of tone on the upper eyelids and the swelling on the lower area. The new Fillerina Gel is developed to help fill in the wrinkles, plump up the tissues and reshape the eyelids. This is possible thanks to a particular applicator that allows to massage the periocular area too. In the new Fillerina Eyes and Eyelids, the mix of hyaluronic acid and collagen molecules is different from the Face Gel in order to answer more specifically to the needs of this delicate facial area. To prepare the skin, in particular before applying the Filler Treatment for Neck and Cleavage, it is recommended to use the Skin Preparatory Cleanser with brush (AED 220). Fillerina Specific Zones treatments are available at leading pharmacies across the UAE including BinSina Pharmacy, SuperCare, Boots and United Pharmacy.